Construction of a nuclear-powered deep-sea research submarine has started in Russia. The sub will also be used in search and rescue operations. An Oscar-class submarine, on which the design of the new submarine is based. A ceremony was held at the Sevmash shipyard in Severodvinsk in northwestern Russia on 20 December to mark the start of construction of the vessel. It was attended by the commander of the Russian Navy, Admiral Viktor Chirkov and Sevmash general director Mikhail Budnichenko. Designed by the St Petersburg-based Rubin Central Design Bureau, the submarine - dubbed 'Project 09852' - is based on the 949A Oscar-class naval submarine. It will be used to conduct multi-purpose research in remote areas of the oceans and to take part in search and rescue operations. The vessel will carry smaller rescue submersibles. In addition, the new submarine will be employed in the installation of subsea equipment and inspections; testing new types of scientific and research equipment; and monitoring transport routes. The expected completion date of the submarine was not disclosed. The Sevmash shipyard's main activity is the construction of ships and submarines for the Russian Navy. 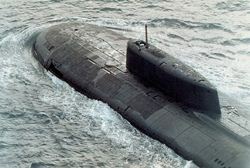 It is the only shipyard in Russia producing nuclear-powered submarines.